With Six Nations fever in full effect I consider the commercial opportunity this provides one of the competition partners – Guinness. Guinness already has a strong association with the contest, and YouGov BrandIndex and Profiles data helps to confirm why the relationship is a beneficial one for the Irish stout giants. The company has decided to focus its adverts - which coincide with the tournament - on legendary personalities, players or moments from the games’ past. Tournament participants such as England’s former fly half Jonny Wilkinson and Welsh winger Shane Williams are the focus of short films honouring their contributions to the sport. 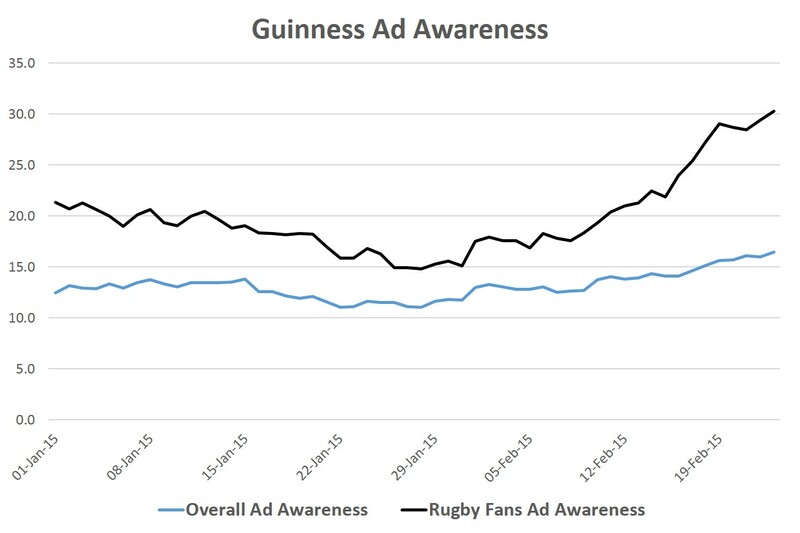 There has been a moderate improvement in Guinness’ Ad Awareness metric since the beginning of the month (whether a respondent has seen or heard an advert by a particular brand in the last two weeks). At the tail end of January, the overall score was 11.0%. This has risen to 16.4% since the tournament began and the campaigns began to gain traction. Of course Guinness is looking to target specific groups with its advertising. We can analyse how much cut through the adverts have achieved among rugby fans. Here we see a more telling increase in score. From 14.8% at the end of January to a current score of 30.3%, it’s clear that the campaign is proving memorable among those that Guinness wish it to. YouGov Profiler is another tool which underlines why Guinness are getting it right with its advertising efforts. The profiler indicates to us what differentiates customers of Guinness from their comparison set. We can see that their favourite sport is Rugby Union and it is also one of their niche interests. They are also likely to be a customer of The Six Nations itself. Additionally, when profiling rugby fans themselves, it turns out that they would describe themselves as someone who ‘enjoys going to the pub for a drink’, and as a person that ‘doesn’t mind paying extra for good quality products’. A match made in heaven therefore? As we move towards the Rugby World Cup later in the year, Guinness will be hoping that the success and sales they have cultivated with the Six Nations puts them in enviable position come tournament time. Achieving a loyal customer base seems to be something they have been able to do, as does increasing perception of their marketing campaigns amongst their target demographic.